Extreme Engineering Solutions, Inc. (X-ES) introduces the XCalibur1641, a high-performance, 6U VPX, single board computer supporting Freescale QorIQ P3, P4, and P5 processors. The stock processor is a Freescale P4080. The P4080 processor brings the raw power of eight e500mc cores running at up to 1.5 GHz and dual-channel DDR3 memory, delivering unparalleled multi-core performance. The XCalibur1641 is also available with a quad-core P3041, quad-core P4040, single-core P5010, dual-core P5020, or quad-core P5040 processor. It supports up to 16 GB of DDR3-1333 ECC SDRAM in two channels, up to 512 MB of boot flash (with redundancy), up to 64 GB of user flash, and up to 256 GB of optional SATA user flash. Standard I/O for the XCalibur1641 includes four Gigabit Ethernet ports, up to five SATA 3.0 Gb/s ports, two USB 2.0 ports, and two RS-232/422/485 serial ports. 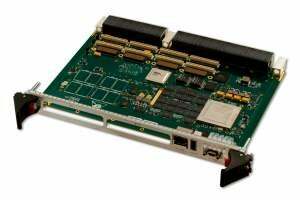 Application-specific I/O is added easily via dual PMC/XMC sites with a PCI Express interface (x8) to each XMC site. Supported Board Support Packages (BSPs) are available for Green Hills INTEGRITY and INTEGRITY-178B tuMP, Wind River VxWorks, and Linux. The XCalibur1641 is available from Sarsen Technology.